The UAE is one of the highest energy consumers per capita in the world. The extraordinary economic growth of the country since the 1960s, a growing and more urbanised population, changes in lifestyle and work habits, a construction boom, as well as a relatively low subsidised energy cost have all contributed to elevated energy consumption. This has unsurprisingly resulted in high levels of pollution and carbon emissions. In response to this phenomenon, the UAE government has committed to a change in strategy, becoming one of the most active signatories of the United Nations Sustainable Development Goals (SDGs) 2030 and the Paris Climate Agreement. The UAE’s new Green vision has been articulated in the UAE 2021 Vision and UAE 2030 Green Agenda, both focusing on ensuring environmentally aware economic development for the nation. 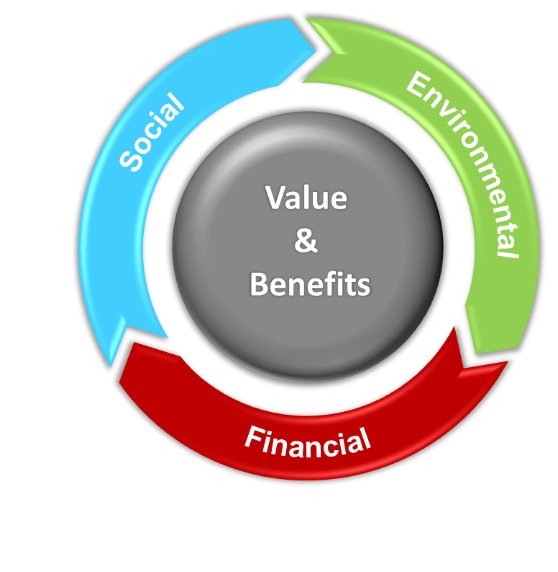 Waste management – enhanced value creation through optimised material flows and waste management. The UAE has also promoted various green construction and sustainable design initiatives, both at the federal and Emirate levels. When it comes to the implementation of new sustainable design techniques, few places are better suited or offer a larger canvas than the fast-growing cities of the UAE. Dubai places third in the list of global cities with the highest number of green buildings. At the time of writing, Dubai had over 550 projects undertaking LEED certification (see a description of this certification system below). 81% of in-progress projects in Dubai are being certified, the highest ratio of any city globally. The UAE is among the top 10 countries holding LEED certifications outside the US. There are many notable green buildings in the UAE which have been certified as environmentally sustainable. The number of structures keeps increasing. According to the Green Building Information Gateway, the UAE has more than 1,000 green building certifications, 18 of which have the highest level of certification, LEED Platinum. The trend towards advanced and green building does not stop with the external building though but moves to the inside as well. Forced to step up its game to match up to the luxury, technological advances and practical design of its exterior counterpart, the interior design sector in the UAE is one of the most forward-thinking anywhere on earth today. It has become one of the most dynamic and revolutionary in the world. This has allowed interior design companies to not only come up with new ideas but to roll them out on a grand scale as well. With the city growing at such a rapid rate, it is a little wonder that the UAE is now home to one of the most rapidly rising interior design sectors of today. Dubai especially is attempting to make the most of this new movement and is utilising everything from the external build to the interior fit out to place a focus back upon sustainability. Dubai is pushing to become one of the ‘greenest’ cities on the planet. More weight is placed on this need as research shows that if nothing is done to improve these cities’ capability to adapt to changing climates, they will simply become more and more arid. The rising challenge that cities like Dubai face due to climate change is indeed an uphill battle. However, this has allowed interior fit out companies Dubai-wide to try new technology and techniques. These practices and ideas make Dubai a greener economy. This new call to action from the whole interior design sector, added to the push for more sustainable building practices, has led to several sustainable certifications becoming more and more prevalent, not to mention necessary. Whether you are designing the interior of an entire building or simply looking to upgrade and require a new interior fit out, there are now accreditations and certifications frameworks that enable your company to achieve its sustainability goals. 3. What is Certification & Why it’s Important? 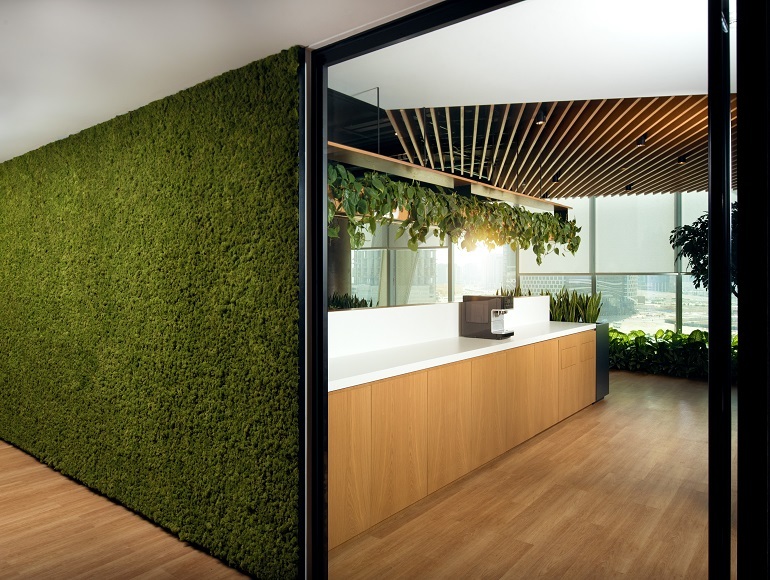 Other significant green building benefits include an increase in occupants’ productivity and good health, as well as an improved indoor environmental quality. In a world where there is more focus being placed on a need to use sustainable building practices and design techniques, there is also a need for certifications that ensure contractors are supplying what you need the most. Certifications ensure that you are provided with the most sustainable design, build and fit out, from the start of the fit out cycle; which includes sourcing and production of materials, to installation, maintenance and removal. Globally, we are witnessing a rise in sustainable workplace fit out techniques and technologies. This has led to the appearance of various “green” certifications that highlight precisely how green a building project is. Considering the design, construction, maintenance and operation of these green buildings, retail spaces, offices and other structures, these certifications have become a new standard in sustainability. One of the more widely used of these certifications is the LEED or (Leadership in Energy and Environmental Design) certification developed by The U.S. Green Building Council or (USGBC). The LEED certification program is used all over the world and has gained popularity due to the way in which it classifies building projects. With the aim of creating more environmentally responsible and sustainable buildings, the LEED certification program uses a grading system of Certified, Silver, Gold and Platinum to show what level of sustainability any building or office fit out can achieve. The original LEED certification program began back in 1998 but has evolved massively since its conception. Operating in different sections, LEED certification can be split into five categories, namely: Green Building Design & Construction, Green Interior Design & Construction, Green Building Operations and Maintenance, Green Neighbourhood Development and Green Home Design & Construction. The LEED program also makes up the foundations of other sustainability rating systems as well. This certification focuses more on the health and well-being of buildings globally. In 2018 it released version 2 of the standard which includes 10 concepts: Air, Water, Nourishment, Light, Movement, Thermal Comfort, Sound, Materials, Mind and Community. Each concept category encompasses objectives that focus exclusively on the health and wellness of the people in buildings. The WELL standard is also designed to work harmoniously with holders of existing standards such as LEED, being a complementary framework that focuses on a building’s human impacts. The Building Research Establishment Environmental Assessment Method (BREEAM) developed by the building research establishment (BRE) in the UK is the world’s longest-running method of building assessment when it comes to sustainability. This method of assessment predates LEED by eight years but has since been used less and less with LEED becoming the most prevalent. The Pearl Rating System (PRS) is a framework for sustainable design, construction and operation of communities, buildings and villas. It is a unique certification system that was specifically designed to suit the specific climate and environment of Abu Dhabi. The PRS is divided into seven categories with both mandatory and optional credits. To achieve a 1-Pearl rating, all the mandatory credit requirements must be met. To achieve a higher Pearl rating of 2-5 Pearls, all the mandatory credit requirements must be met along with a minimum number of credit points. All new projects must achieve a minimum 1-Pearl rating to receive approval from the planning and permitting authorities. Government funded buildings, on the other hand, must achieve a minimum of 2-Pearl rating. The Sa’fat system has been implemented for all buildings in Dubai Municipality’s residential, commercial, and industrial sectors. Sa’fat has four types of rating (Bronze, Silver, Gold and Platinum) which covers carbon reduction, energy saving, internal health environments, smart applications, innovation requirements, and a building’s expanded lifespan. The LEED certification has been embraced throughout the UAE and is currently the most popular type of certification sought. The interior design sector in the country has numerous projects and the interior design sector in the Middle East has already seen a myriad of projects incorporating this certification out of a conviction of its benefits. The Smart Dubai initiative is based on the vision of His Highness Sheikh Mohamed bin Rashid Al Maktoum to make Dubai the happiest city on earth. The mandate of the initiative is to make Dubai a more efficient and safe not only to the tourists but more so to the residents. 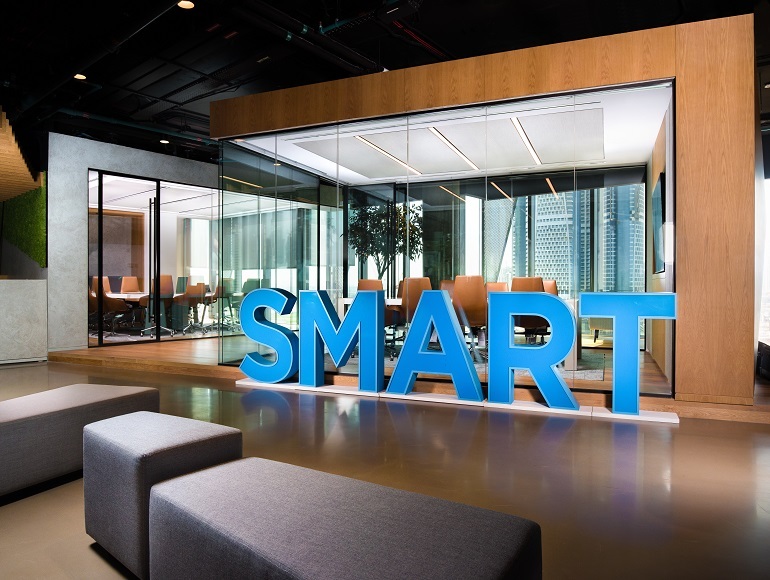 The Smart Dubai Office is the technology arm of ‘Smart Dubai’, an initiative to transform the region into the world’s smartest city by 2021. The 1,850m2 office project was designed by Design World Partnership (DWP). The organic shapes and flow was drawn from the natural environment, particularly Dubai’s characteristic sand dunes and the Creek. Summertown Interiors was responsible for the project’s fit out and with managing the LEED certification. Bringing the organic design to life, Summertown created bespoke curved wooden ceiling panels, and wooden oak floors. Summertown also made extensive use of natural plants and roped partitions. Sustainability was inbuilt from the inception of the project, from extensive use of recycled materials, to the use of lighting controls and chimers cut down on energy use. Green waste management strategies were implemented to reduce environmental impact during the project, resulting 50% of waste being successfully recycled. Project purchasing was driven by sustainable criteria. Summertown also carried out daily tracking and monitoring of energy and water use during works. At the same time, the most up-to-date, working technologies were implemented in the office, including a virtual assistant and advanced collaboration solutions. An example of these is the all-in-one meeting room control pad for presentation display, lights and blinds, which also connects wirelessly to different devices like laptops, tablets and smartphones, and various “smart” shared working areas. Following Ahrend’s global design guidelines as well as strict green office standards, the space was optimised to encourage ABW (Activity-Based Working). AWB rethinks the use of space to encourage employee engagement and to increase productivity. Summertown Interiors is the leading green commercial fit out specialist in the region. 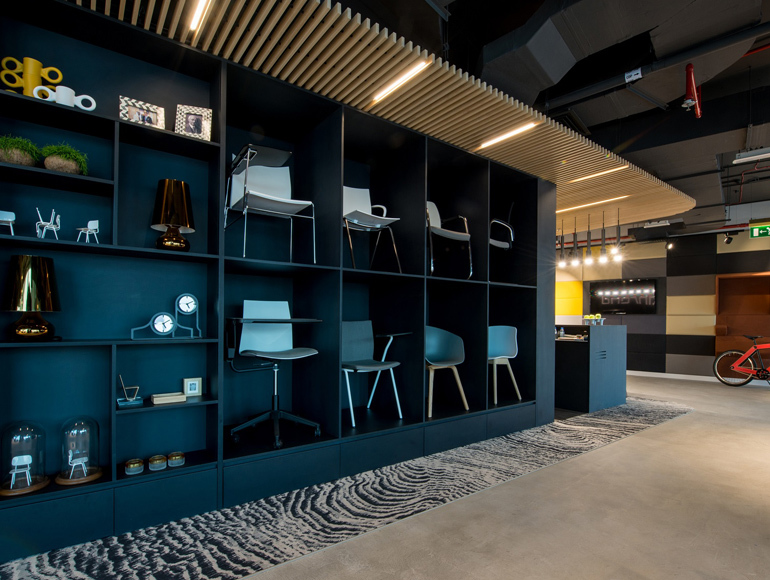 It is not surprising that Summertown became the first interior fit out company in the UAE to achieve LEED Gold for its Headquarters and showroom. 5. Is your office Green? Prove it. Get LEED certified! In today’s age, there is an ever-pressing need for sustainable workplaces. The importance of businesses and offices being certified as sustainable with the use of accreditations like LEED has never been more pertinent. There are many reasons why this is the case. For example, the overshadowing advancement of global warming and climate change on a whole has led to some cities being at risk of becoming arid cities. Dubai is one of those at risk and so in these cities, the focus has to be on sustainability, and effective or efficient use of materials, spaces and everything that is involved in an office or business fit out. A lot of this can be covered during the design phase of your office fit out. This means that you can plan to include sustainability as the main focus even from the very start. The importance of certifications such as LEED for your company, office or building is growing. More and more cities are beginning to require new or retrofitted buildings or offices to accredited certifications, thus showing exactly how sustainable and effective their company is. When more companies are created in this way, we will see more sustainable cities such as the one Dubai is attempting to become. As good global and corporate citizens, every company must strive to protect the environment and to reduce resource depletion. Numerous studies have shown that sound and sustainable workplace design and fit out have measurable economic benefits to both landlords and tenants. Additionally, companies with clearly articulated “green” principles are regarded in a better light than those with less corporate social responsibility. As buildings account for up to 40% of the consumption of raw materials and energy supplies, any action that helps to reduce this figure will have significant positive effects on the overall environment. In the developed countries, buildings are a major source of CO2 emissions of up to 39%. Green buildings use around 36% less energy than traditional structures and so can play a critical role in reducing these emissions. The choice then it would seem is for your offices or company to embrace the ways of the future or choose to actively seek out design that is climate-responsive or sustainable. The higher your business or company’s LEED rating is, the better it looks to investors or clients. The more appealing it becomes as a space to work in or a company to work for, the more productive the staff, eventually giving you higher profits and making your company more effective. Choosing the right fit out company for your offices is one of the most important decisions you can make. For many reasons both ethical and business related sustainable workplace design and green fit out are the way to go. If you need to retrofit or re-design your offices to obtain a LEED certification, then it is critical that you choose a company with a proven track credit and the requisite credentials. The right choice is a firm that has experience in carrying out LEED-certified office fit outs, and that understands that this involves incorporating “green” principles from the very beginning of the design process, all the way to the end, including waste disposal. Attention will have to be paid to each and every detail; details like the re-use of materials so as to cut down on impact to the environment while taking all your business needs into account. This same interior fit out company will be able to execute the required design and fit out to help you pass the certification. You will need a company like Summertown. Summertown has extensive and detailed LEED experience, enjoying an unbroken record of 100% success rate in gaining LEED certification for clients. For over two decades, this company has been striving for excellence and achieving it at every turn. When it comes to carrying out a LEED-certified office or commercial fit out, Summertown is amongst the very best and has carried many projects that demonstrate this. A solid mission to consistently deliver high-end interior design projects, both on time and in a budget, makes them one of the UAE’s leading interior fitout contractors. They are not merely the smart choice for your company’s interior fit out, but indeed the only choice. If your company, like so many others today, decides to go for a more sustainable workplace fit out, and would like to gain a LEED certification, then there really is only one contractor that has the essential know-how and commitment and that is Summertown. Contact us today!